David Rice reports for the Seminole Heights Patch that The Girl Scouts of West Central Florida have taken it upon themselves to work toward changing the professional landscape through their Mind for Design camp. Educators have found through various studies that young girls begin to inexplicably move away from science and math disciplines around the fifth grade. 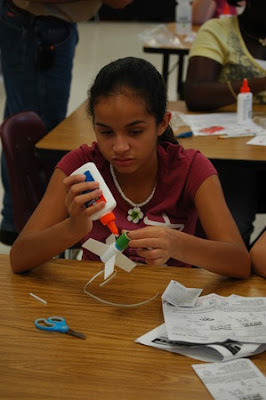 The Girl Scouts identified this is as a concern and are working toward reinvigorating girls' passion for the science of engineering in grades 6-12. A major step in the right direction, The New York Times reports that American Girls recently won all of the top spots at the First ever Google Science Fair. Budding inventor and scientist, Shree Bose, tackled ovarian cancer, and that research won her the grand prize and $50,000 in the Google Science Fair. For the winning research Ms. Bose looked at a chemotherapy drug, cisplatin, that is commonly taken by women with ovarian cancer. The problem is that the cancer cells tend to grow resistant to cisplatin over time, and Ms. Bose set out to find a way to counteract that. Read more here. Video below provided by My Fox Tampa Bay. Do you think more girls in the future will be more likely to pursue careers in science, technology, engineering and math?